Results from a 2018 survey conducted by the Queensland University of Technology (QUT) in Australia found that one in every five women and one in every eight men are getting less sleep because of time spent on their smartphones. Researchers looked at the results from a survey on smartphone use that involved more than 700 Australian men and women ages 18 to 83 and compared it to data from a similar 2005 survey. The results were published in the journal Frontiers in Psychiatry last month. The team at QUT found a rise in “technoference” over the 13 years that took place between the two surveys. The term refers to “everyday intrusions and interruptions due to mobile phone devices and their usage,” according to the study. We spoke with study leader Dr. Oscar Oviedo-Trespalacios, from QUT’s Centre for Accident Research and Road Safety, to learn more about how phones may be interfering with human sleep. Compared to survey answers from 2005, there was a significant increase in people blaming their phones for their sleep loss, a decline in productivity, increased risk-taking while driving, and even more physical pain, QUT said in a statement about the study. More than 24 percent of women and 15 percent of men can now be classified as “problematic phone users,” according to the study’s authors. That number jumps to nearly 41 percent of 18- to 24-year-olds and reflects 23 percent of 25- to 29-year-olds. Oviedo-Trespalacios said they expected to see a change in the survey results over a 13-year period, as mobile phones are very common now. It was important for the QUT-led team to identify the major issues of today, he told us. The data collected from both the 2005 and 2018 surveys was self-reported, which experts say could have potential limitations. “One has to wonder if people want to give socially desirable answers – therefore underestimating the toll on sleep quality that the phones are taking (knowing that the messaging is that it is not good to sleep with your cell phone),” Terry Cralle, a registered nurse, clinical sleep educator, and sleep consultant for Saatva who is unaffiliated with the study, told Mattress Clarity. “It is obvious that when cell phones are used ‘incorrectly’ – i.e., right before bedtime, during the night, etc. – they are disruptive to our sleep which in turn negatively impacts health, wellbeing, performance, and quality of life,” Cralle said. Cralle added that many people have told her they sleep with their phone and that the notifications that go off all night do not bother their sleep. In actuality, she said, the notifications are bothering their sleep. 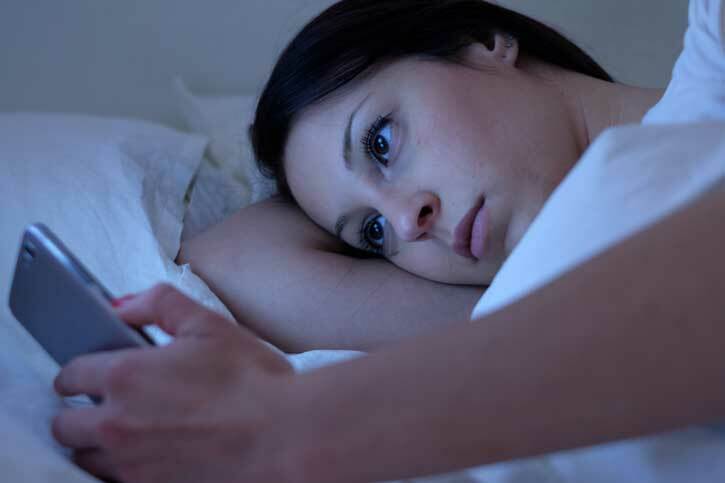 Additionally, past studies have confirmed that blue light (the kind emitted from smartphone screens) can interfere with your brain’s ability to release melatonin, a naturally occurring hormone that tells your body it’s time for bed. While the results from the study reflect the current climate on mobile phone use in Australia, both researchers and sleep experts agree the results may be similar across the globe. Oviedo-Trespalacios said his team is in the process of developing interventions and they expect to have results later this year.